Using a trauma-informed approach, the music therapists promote healthy pro-social skills, increased resilience, and developing consistent relationships. The program maintains a client-led initiative that allows veterans to develop self-advocacy skills. 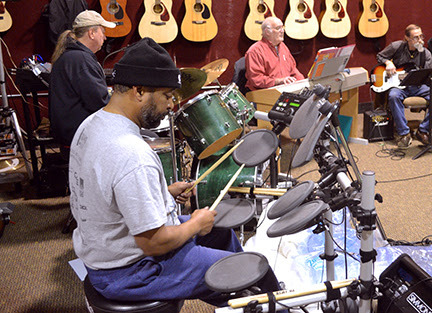 ​Programming includes opportunities for individualized adaptive music lessons as well as a community jam group. In the community setting, participants exercise their developing resiliency and self-expression skills. As a result, music therapy gives a voice to veterans who otherwise struggle to express themselves and/or process the trauma experienced inside and outside of their military service. Are you interested in how music therapy can help you or your loved one? Schedule a consultation now. Work at the Snohomish County Music Project focuses on clients of all ages from all parts of the county. From seniors in Snohomish, to youth in South Everett, to children in Quil Ceda, the Music Project serves a diverse group of people. Each population has unique challenges. Since these groups vary so widely in age and location, our community partners don’t interact with each other often. Our partners are part of the community and deeply embedded. It makes for stronger relationships and sustainable support. Since these partners rarely interact with one another, the chance to hear how programming is positively influencing each population is rare. For this reason, the Music Project will release a year-end report in January. The Veteran Artist Reception on November 20 was a success. Attendees asked questions from the artist, Steven Markussen. His exhibit is currently displayed in the Northwest Music Hall lobby through the end of the month. Markussen also presented a video of the creation of his pieces. In it, he revealed insights on each piece. The exhibit is based off a 2012 VA report on veteran suicide. The Everett Herald featured an article on the “Acoustic Armor” program. Part of the Snohomish County Music Project, this program works with veterans and mature adults. 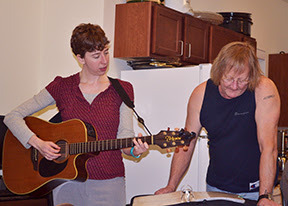 The group meets twice weekly in a “jam band” format, accompanied by individual music therapy sessions. Led by music therapy director Karla Hawley, the group will be performing Friday, November 20 at an Artist Reception from 6 PM – 8 PM. RSVP via Facebook. The event is free and open to the public. Donations are accepted. If a veteran or mature adult you know has a connection with music, see if the Music Project can help by emailing info@scMusicProject.org. The Snohomish County Music Project welcomes visual artist Steven Markussen for a month-long veteran art exhibit from November 6 – November 30. This will culminate in an artist reception on November 20 from 6 PM to 8 PM at the Northwest Music Hall, located inside the Everett Mall. The event will also feature a veteran jam band led by the Music Project’s music therapy director Karla Hawley. The event is free and open to the public. Donations are welcome. This haunting exhibit, “Veteran”, will feature paintings and sculpture on the veteran experience returning home from war. A veteran himself, Steven Markussen brings his own unique insight into conflict, trauma, and recovery. During the artist reception, a veteran jam band, part of a Music Project music therapy program for mature adults 55 and over will play. The band features guitar, bass, drums, violin, and keyboard and will play classic rock of the 60s and 70s. Speaking of the jam band, Karla Hawley, MT-BC, M.Ed., said: “This is a perfect example of community supporting community.” The group is free to join and open to all interested veterans. Rehearsals take place every Tuesday and Thursday at 10:00 am at the Northwest Music Hall.